On July 24, 2015, PolitiFact Wisconsin published a fact check piggybacking on a recent BuzzFeed criticism of a political ad. On July 23, 2015 BuzzFeed published a story about a political ad aired by Restoration PAC in support of the re-election campaign of Sen. Ron Johnson (R-Wisc.). The BuzzFeed story, by Ilan Ben-Meir, focused in part on one of the ad’s images, showing Iranian President Hassan Rouhani apparently clasping hands with President Obama. BuzzFeed published an interactive image that helped exposed the fakery. Why our interest in PolitiFact’s angle on this story? It serves as a good example of poor fact checking. BuzzFeed produced evidence enough to reasonably show the Rouhani-Obama image was altered. But only barely. PolitiFact Wisconsin skipped on its opportunity to strengthen the argument. And compounding the problem, BuzzFeed and PolitiFact Wisconsin failed to preserve strong documentation of Restoration PAC’s use of the altered image. PolitiFact Wisconsin embedded a YouTube video of the ad, and Restoration PAC changed the status of the video to “private.” That change in status keeps PolitiFact Wisconsin readers from reviewing the evidence. We’ll expand on the evidence supporting the claim the image is fake. And we’ll ding PolitiFact Wisconsin for nitpicking the Restoration PAC ad. BuzzFeed could have, and should have, done a better job of proving the image was faked. One way to do that involves finding the original image and showing how it compares to the altered image. Buzzfeed made a half-stab at doing that with its interactive image. 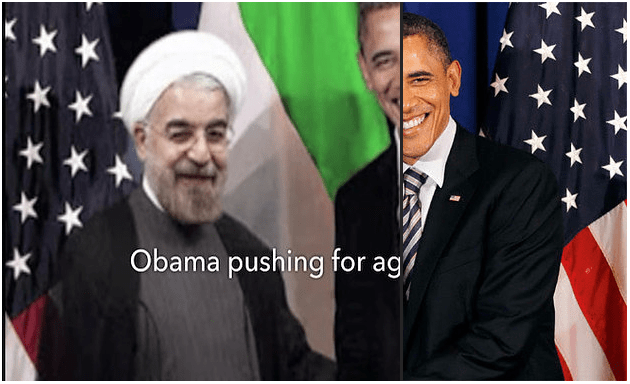 Readers could slide right to show the Rouhani-Obama image to the left (bearing the text “Obama pushing for agreement”) or slide left to show a suspiciously similar image with Indian Prime Minister Manmohan Singh in place of Rouhani. We used image search engine TinEye to find whether the Singh-Obama image predates the Rouhani version. It does. And the close match on specific image details, such as the folds in the background flags and Singh’s hand outline, effectively cinch the deal. The Rouhani-Obama image was faked using the Singh-Obama image as its basis. “Pants on Fire” for Restoration PAC? PolitiFact Wisconsin rated Restoration PAC’s claim “Pants on Fire.” We criticize PolitiFact Wisconsin for nitpicking. Having argued the case PolitiFact Wisconsin failed to make, what do we mean by that? Through an image in a TV ad backing Johnson, Restoration PAC claimed Obama had met with Iranian president Hassan Rouhani. The point of the ad, pointedly, was not that Obama had met personally with Rouhani. The ad pushes the point that the Iran deal primarily benefits Iran. Whether Obama met personally with Rouhani hardly matters to that point. PolitiFact Wisconsin ignored the context of the ad and placed its focus narrowly on the image Restoration PAC used in making its point. We delayed publication of this article for two days to give author Tom Kertscher and/or editor Greg Borowski to respond to our inquiry to them about the PolitiFact Wisconsin fact check. If we hear from either we will update this item. We admonish PolitiFact Wisconsin with the reminder that consistency stands as the key to any set of principles. It is perfectly fair to point out that the Rouhani-Obama photo was altered and to fault Restoration PAC for uncritically using it in the ad. But setting aside guiding principles to produce a narrowly focused rating damages a fact checker’s claim to non-partisanship. We also fault PolitiFact Wisconsin for failing to expand on BuzzFeed’s attempt to prove the image was altered.